This story was updated April 19 at 5:50 p.m. with more information. NASHVILLE — The state House this afternoon approved Tennessee's first gas tax increase in 28 years, voting 60-37 for Republican Gov. Bill Haslam's proposed IMPROVE Act. Senators quickly followed suit, voting 25-6 for the measure. But the Senate-passed bill will have to go back to the House because it differs from the lower chamber's version. The House vote came at the end of a nearly 4 1/2 hour debate in which the Republican majority warred with itself over the fuel increases to help the state tackle an estimated $10.5 billion backlog of 962 specifically identified road and bridge projects across the state. But it was smoother sailing in the Senate where majority Republicans, including top leaders, backed the legislation. 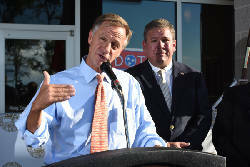 Haslam's bill would increase gas and diesel taxes by 6 cents and 10 cents respectively over the next three years. It also has several fee increases, including a $5 car registration increase and a $100 fee on electric car users. Collectively, it would raise an estimated $350 million that would replenish the state's highway fund as well as boost shared road revenues with cities and counties. But the bill also cuts several general fund taxes in an amount higher than the fuel taxes would hit the average Tennessee family. That total is about $420 million. That includes a 20 percent in the state's sales tax on grocery store food purchases, about a $125 million benefit to most Tennesseans. A change in the state's franchise and excise corporate taxes on manufacturers, worth about $113 million for an estimated 518 Tennessee companies. The bill also continues cutting the state's Hall Tax on individuals' income. The bill would provide an estimated $600 million for 23 Hamilton County interstate, highway and bridge projects. The House Republican's 73-member "super majority" fractured over the bill. But GOP supporters, aided often by most of the 25 Democratic representatives beat back several dozen hostile amendments lodged by some Republicans. The major vote was the defeat of an alternative that sought to use existing sales tax revenue from new and used vehicle sales. 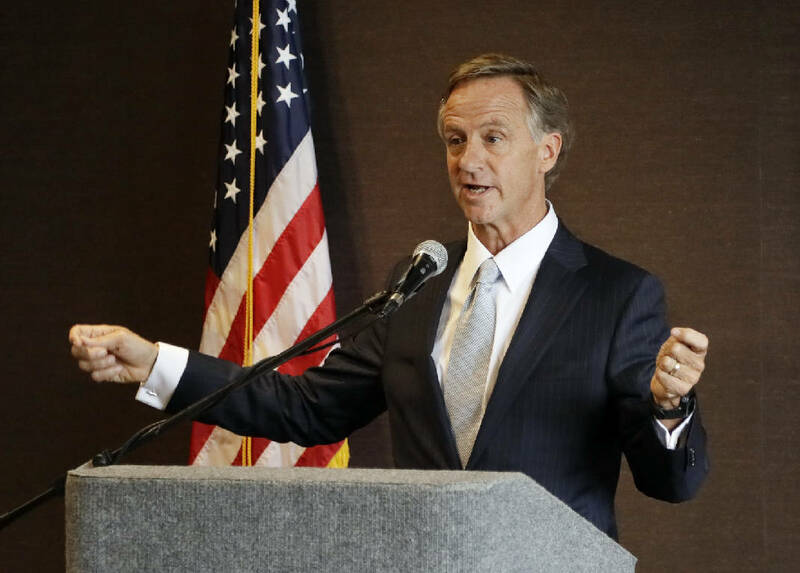 Haslam's legislation, which Senate Republicans pushed to include deeper tax cuts than fuel tax increases, has proven more divisive in the House. Republican House Speaker Beth Harwell of Nashville, who is expected to run for governor in 2018, worked against the gas tax. So did Majority Leader Glen Casada, R-Franklin, GOP Caucus Chairman Ryan Williams of Cookeville, and Assistant Majority Leader David Hawk, R-Greeneville. The alternative amendment was handled by Hawk. Haslam's bill was handled by Transportation Committee Chairman Barry Doss, R-Leoma. Harwell voted for the Hawk alternative but in the end voted for the bill. Casada left in mid-debate, aides said, because of an unavoidable business conflict. Williams and Hawk voted against the bill. During debate, Rep. Mike Carter, R-Ooltewah, other Hamilton County lawmakers and Rep. Ron Travis, R-Dayton, emphasized the importance of the franchise and excise business tax changes in light of surrounding states adopting single-sales factor taxes which the IMPROVE Act would duplicate for manufacturers. Tennessee's current triple-weight sales factor is said to have been a key factor in Collegedale-based McKee Foods' decision to expand at its Virginia operation as opposed to the Chattanooga area. Without mentioning McKee's name, Carter said one company had moved 100 well-paid executives out of Tennessee because of the tax hit the firm was taking on franchise and excise taxes. Meanwhile, Travis told the House that an unnamed company and the prospect for 1,500 new jobs for Rhea County could be at stake if the corporate tax change for manufacturers wasn't changed.